Children who are in between early elementary grades and the teenage years are often referred to as tweens. A hallmark of the tween years, which span from age 9 to 12, is the expansion of social interactions with peers. This can create new challenges for parents on how to balance their tween’s desire for more freedom with parents’ responsibility for supervision. The C.S. Mott Children’s Hospital National Poll on Children’s Health asked parents of tweens age 9-12 years about their views on keeping track of their tweens. About 1 in 4 parents were very concerned about their tweens experimenting with sexual activity (28%), marijuana or other drugs (27%), beer or liquor (26%), and guns or other weapons (25%). Parents reported greater concern about tween boys experimenting with guns, but otherwise had similar levels of concern for their tween boys and girls. Two-thirds of parents (68%) agreed that parents need to give tweens some freedom to make mistakes. Nearly half (46%) of parents rated themselves as more strict than the parents of their tween’s friends, while 45% rated themselves as about the same and 9% as not as strict. Nearly all parents (94%) agreed that social media makes it easier for tweens to get in trouble. However, 61% felt that social media makes it easier for parents to keep track of tweens. Thinking about a hypothetical situation where their tween was invited to a boy/girl party at the home of a classmate whose family the parent did not know, 91% of parents would talk with the classmate’s parents when dropping their tween at the party, and 76% would call ahead to make sure the classmate’s parents would be supervising the party. 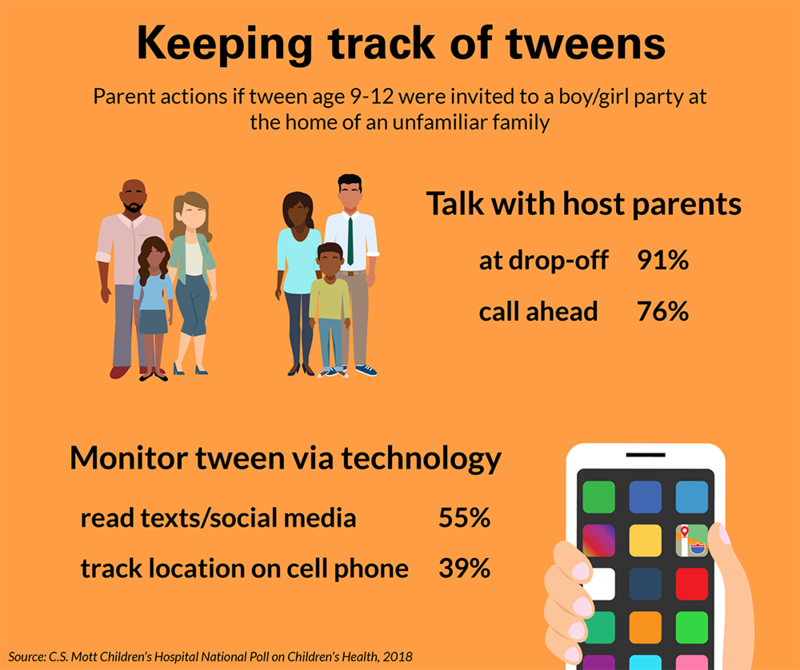 Some parents would use technology to supervise their tween in relation to a boy/girl party: 55% of parents would read their tween’s texts or social media to find out information about the party, and 39% would track their tween’s location on their cell phone during the party. Mothers were more likely than fathers to say they would use technology to monitor their tweens. Two-thirds of parents agree that parents need to give tweens some freedom to make mistakes. 9 in 10 parents feel social media makes it easier for tweens to get in trouble. Mothers are more likely than fathers to monitor tween by reading their social media or tracking their location via cell phone. Findings from this Mott Poll illustrate some of the very real challenges of parenting during the tween years. Unlike younger children who need adult supervision throughout the day, most tweens are able to spend periods of time without an adult present—but not to the extent of independence that many teenagers have. Parents must balance their responsibility to help their tween learn to be responsible and make good decisions, while ensuring their tween’s safety. In this poll, two-thirds of parents believe that tweens need freedom to make mistakes. Parents may identify (or even create) situations for their tween to stay home alone, to assume greater ownership over their schoolwork, and to socialize with peers without the immediate presence of parents. These learning opportunities will differ from family to family, and likely will increase over the duration of the tween years. Parents in this Mott Poll did not demonstrate overwhelming fears about their tweens’ likelihood of engaging in risky behaviors often associated with the teenage years. About 1 in 4 parents in this Mott Poll expressed a high level of concern about tweens’ experimenting with alcohol or drugs, sexual activity, and guns or other weapons. Overall, the level of parental concern did not differ between these behaviors, and did not have conflicting views for their sons and daughters. The exception was an increased level of concern about tween boys experimenting with guns, which may reflect parental awareness of gun accidents in this age group. This Mott Poll presented parents with a hypothetical situation in which their tween was invited to a boy/girl party at the home of a classmate whose family the parent did not know. Talking with the host parents was the most common strategy that respondents would use to make sure the party would be appropriate for their tween. But while nearly all parents would talk with the host parents when dropping off their tween at the party, only three-quarters would call ahead to ensure the parents would be onsite during the party. Whether to check in with other parents is a common decision during the tween years, and tweens may argue that “you’re the only parent who does that.” Indeed, 46% of parents believe they are stricter than other parents; however, parents may be surprised that similar conversations take place in other families, and that their views on balancing tween freedom and parental supervision may be shared widely. Checking in with other parents is a good strategy to find out the parenting views of the tween’s peer group, and to create a common set of expectations around social events. This Mott Poll report also highlights the importance of social media on parenting during the tween years. For many families, a major decision involves if and when the tween should get a cell phone. However, even tweens who do not have their own cell phone will interact with social media through their friends’ cell phones or their computers. It’s unrealistic for parents to think they can shield their tween from the influence and effects of social media. Parents have mixed feelings about social media, with 9 in 10 parents indicating that social media makes it easier for tweens to get in trouble. At the same time, 6 in 10 parents feel social media makes it easier for parents to keep track of tweens. This was evident by parents’ strategies around the hypothetical party. Over half of parents – and more mothers than fathers – said they would read their tween’s social media to learn more about the party. In some families, reading text messages or social media posts may be perceived as parents spying on their tweens. However, many families have established specific rules with their tweens around cell phones and social media accounts. Examples include sharing passwords with parents, setting the expectation that parents will read social media interactions, and setting limits on when cell phones can be used. Establishing family rules around the use of social media, and discussing the reasons for those rules, is an important part of parenting tweens. This report presents findings from a nationally representative household survey conducted exclusively by GfK Custom Research, LLC (GfK), for C.S. Mott Children’s Hospital. The survey was administered in November 2017 to a randomly selected, stratified group of parents age 18 and older (n=2,005). Adults were selected from GfK’s web-enabled KnowledgePanel® that closely resembles the U.S. population. The sample was subsequently weighted to reflect population figures from the Census Bureau. The survey completion rate was 60% among panel members contacted to participate. This report is based on responses from 717 parents who had at least one child 9-12 years. The margin of error is ±2 to 4 percentage points. Findings from the C.S. Mott Children’s Hospital National Poll on Children’s Health do not represent the opinions of the University of Michigan. The University of Michigan reserves all rights over this material. Clark SJ, Gebremariam A, Singer DC, Schultz SL, Freed GL. Parenting tweens: Balancing freedom and supervision. C.S. Mott Children's Hospital National Poll on Children's Health, University of Michigan. Vol 31, Issue 3, March 2018. Available at: https://mottpoll.org/reports/parenting-tweens-balancing-freedom-and-supervision.